Here are some pattern details for this diamond baby quilt. I used an equilateral triangle ruler to cut triangles from fabric. Triangles were cut from 6.5 inch strips of fabric -- I used about 32 different fabrics for this quilt, so almost every full diamond was unique. If you cut this many fabrics up, and cut diamonds from them all, you'll have enough pieces left over to make a full size quilt or about three more baby quilts! I laid the entire quilt out on my dining room table, and started sewing the triangles together in rows, and then the rows together. To finish this quilt, I followed Red Pepper Quilt's binding-free tutorial. I thought it was a great way to finish up a simple baby quilt! 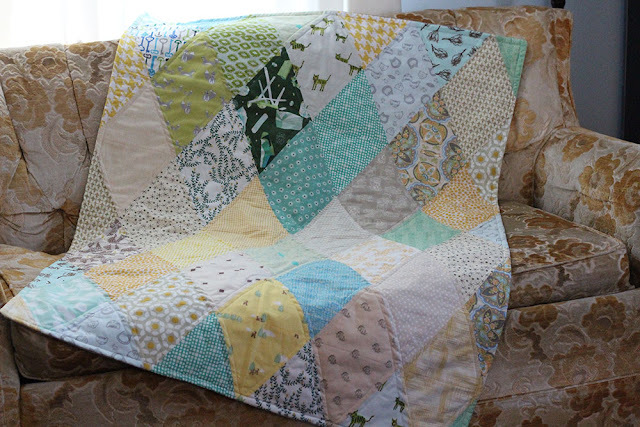 If you are going to attempt a quilt like this I recommend using SPRAY STARCH! I use Faultless Premium starch -- it is inexpensive and smells fresh and clean. I may try this tutorial by Molly Flanders on a different way to sew equilateral triangles together, when I use up my three-quilts' worth of scraps!